Wednesday April 13th 1904 I felt better today. I worked in the forenoon on a tatting pattern. I sewed some in the afternoon. I am taking it as easy as possible. Thursday April 14th 1904 I was busy all forenoon with the work. I made yeast and baked little cakes. I coughed so in the afternoon that I could not do any thing. I went to bed early. Friday April 15th 1904 I baked bread and got the dinner. I feel some better. Will went in town and got some stuff to make cough syrup that I made in the afternoon. Mother went down town tonight. 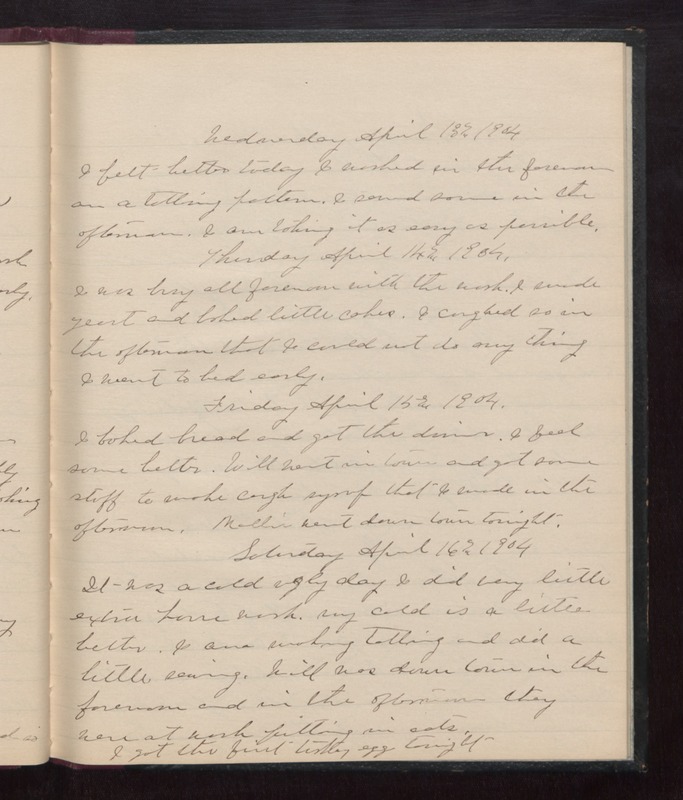 Saturday April 16th 1904 It was a cold ugly day I did very little extra house work. My cold is a little better. I am making tatting and did a little sewing. Will was down town in the forenoon and in the afternoon they were at work putting in oats. I got the first turkey egg tonight.